Home » Articles » 73. How Was Your Birth? 73. How Was Your Birth? Being born is not exactly easy! You’re enjoying the warmth of the uterus. Being delightfully rocked back and forth. Sleeping, floating, sucking your thumb. And then one day, the outer walls of your safe place begin to contract. And in a prolonged hours-long process, you are slowly pushed through a narrow passageway. Then there is the exit and you are surrounded by bright lights, coldness and loud noises. Welcome to earth! Being born isn’t fun for any child. Every birth is stressful. You go through a first-class rollercoaster. And I haven’t even mentioned births with complications! What are the consequences of an intense birth? The consequences of an intense birth, that made a huge impression on you, can be that you still have physical or emotional problems. It can be the cause of depression or, for example, skin disorders. When you go back in your life and focus on your birth, it’s possible for you to feel that the key is there for all of the complaints that you have. Many alternative-healing methods focus on this. And they all work! How does the MIR-Method help to heal your birth trauma? By doing the MIR-Method, you heal, layer for layer, the emotional trauma that you experienced during your birth. I explain how each step works below. Step 3: “Detach father. Detach mother.” You may have unconsciously picked up on the emotions your father and mother experienced during your birth. Because it happened during one of the most impressive experiences in your life, they became deeply imprinted. Even if your father wasn’t present during your birth or if your mother didn’t really want to give birth to a child. Or maybe fear was a factor because it was a difficult birth. Parents’ disappointment can also play a role. “Oh, no, another boy/girl!” All of the deeply imprinted emotions slowly become detached with step 3. They are not your emotions but those of your parents. Step 4: “Clear meridians” supports step 3 by helping to purge your system of emotions. Step 7: “Fulfill basic needs” provides for the supplementing of “Certainty”, “Security”, “Safety” and more basic needs which were insufficiently present during or after birth, such as “Comfort”. Step 8: “Optimize Chakras en Aura”. This step is unbelievably important, including for highly sensitive people. If you felt unsafe and afraid during your birth, there’s a good chance that chakra 1 is disturbed. That is the chakra that can be found on the bottom of your pelvis. If it is disturbed, you have trouble being grounded. Step 8 helps you to heal chakra 1, so that you’re better protected from emotions and energies of other people. Step 9: “Clarify mission” has a positive and healing effect on your birth. When you came to earth, you probably had a reason for coming here. Some people have great and compelling missions. Others are a part of change and still other people have the task of experiencing what it is to be human. If your birth was difficult, it’s possible that you have trouble remembering your mission. Through the disruption that took place during the first few hours, you can have lost the connection with your mission. By doing step 9, you restore the connection and slowly but surely know again why you wanted to be born on earth. Many pieces of the puzzle fall into place and your life becomes lighter and more effortless. Stoplights are more often green! 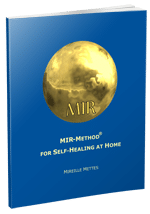 In short, do the MIR-Method to get the first early disturbances out of your system and heal yourself at a deep level. Good luck! What about you? How is life on earth for you? And what do you know about your own birth? Please let me know about it below! Thank you very much! That you can live your life to the fullest in a way that feels good to you! The MIR method continues to change and heal my life. My birth and the months preceding my birth were filled with trauma. My biological mother admitted that she tried everything she could to prevent a full term pregnancy and live birth. This explains so very much. I am so very grateful to you for having the grace and the courage to share your method and for making it available to all. Thank you so much for your kind words! And I am very pleased to read that it helps you become aware of what may be the cause of any complaints you may have. Glad to read that the MIR-Method works so well for you! Keep going! Thank you for doing so much good in the world. You have helped me so much. I went under hypnosis and viewed myself being born. supportive,no money, children at home ,not enough food.What to do with another child?? handed me up to God. has kept me safe and taken me through my tramas. I am 86 Years old now and have a lovely supportive family around me and wonderful friends. I live a peacefull happy life. My proplem is asthma and severe allergies. Thank you again for your wonderful heart. Thank you for your life story! Your start in life has been quite a challenge! How wonderful that you felt the protection of this light energy around you! Please note that asthma can have deep grief underneath and may take a long time (months-years) to heal. Same goes for the allergies. You may consider a consultation with a MIR-Method coach, but as long as you feel it gets better, you are well on your way! I’m going through a tough time in life. I caught my husband cheating on me. He promised & left that girl. That girl was a prostitute from Pakistan. But I found out that even after all the promises & swearing on kids he was still with her. I caught him again & he again pleaded & I gave him chance. 6 times this happened & finally that girl was sent back to her country last year. We have been together for 25 yrs & married for 20 yrs. we have 3 children. I still love him & don’t want to get separated. but now I’m very insecured & can’t trust him anymore… Please suggest what can I do & how can I make him see that the other girl only wants money from him… I want him back in the family… So does my children & his parents. He makes me feel very lonely & unwanted. Thank you for your openness! It is very hard for you what you have gone through. I understand how difficult it may be. You have given him many more chances, which he can be grateful for. The way I look at it, is that your self esteem needs to be stronger and you need to set boundaries. When you feel again what a great woman you are, raising 3 children and even supporting your husband, you will understand how lucky your husband should be. I hope for him that you can forgive him and that you can bring your marriage back to bloom. However, you do need to discuss what happens if he would ever cheat again. You are wonderful and he should understand what he puts at stake if he repeats. Thank you so much for your openness and I truly hope you can find back each other’s love! Thank you for your message. I unsubscribed you from the newsletter, so it should work now. I am very happy for you that you found a way. Any way is fine. People just need to find their way to heal. MIR-Method or any other method. Thank you for your kind words and I am glad you are happy too!